Chiara, Dimitrova, Callas and Carreras recordings. "Celebrity photographer Gautam Rajadhyaksha died of cardiac arrest here [Mumbai] on Tuesday. He was 61. Rajadhyakasha, who became famous for his candid potrayals of Bollywood stars from Durga Khote to Aishwarya Rai, loved drama, visual - and aural. 'He was a great opera lover,' recounts filmmaker Shyam Benegal, shooting pictures of whom was Rajadhyaksha's first professional assignment. 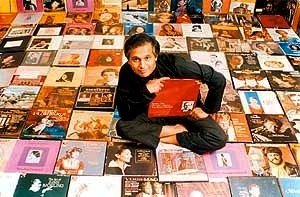 'Gautam had the finest collection of LPs. He was an absolute walking encyclopedia of opera. He could tell you everything about every singer, Maria Callas to Jose Carreras. He even lectured on opera at various societies.' Rajadhyakasha's passion for the drama that makes opera reflected itself in his photographs, many of people with undoubtedly beautiful faces, but whose personalities came through in his compositions." [Source] Read more about Gautam Rajadhyakasha here.